Alexa lopez is an la based photographer and all around dream babe. we first met on set and i immediately was inspired by her work ethic and beautiful vibe. i could instantly tell she was a force!! since that first collab, alexa has since created some of my most favorite imagery for bratty official. whether we are working together in la, the desert, or in the middle of a carnival, this lady oozes a calm, graceful attitude and killer tomboy style always. i asked alexa a few questions to learn more about her daily rituals, favorite album, and her motivations to keep on hustling. BRATTY official: Most special piece of clothing in your closet? 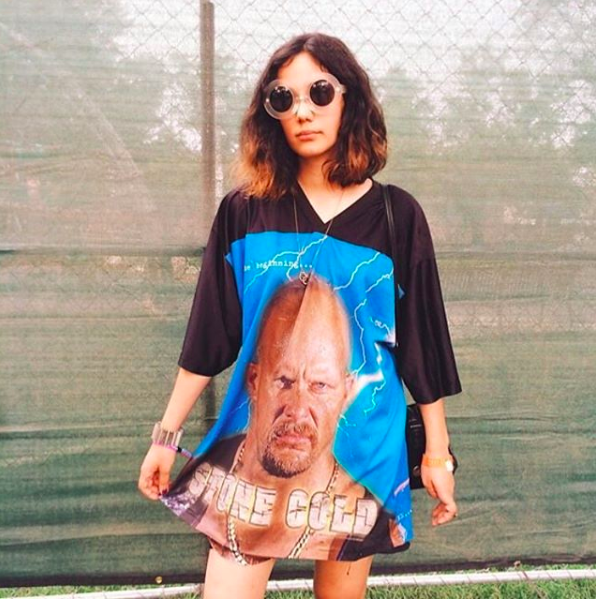 ALEXA: My stone cold steve Austin shirt that I found thrifting in 2010 somewhere in Ohio. Describe a dream day off, do you have any specific morning rituals that you like to start your days with? Dream day off would definitely include no one bugging me for work related things. Ideally, I wouldn’t want anyone to bug me but such is life. :) Would definitely spend time outside hiking, exploring, taking photos and listening to my favorite music. Morning and night rituals include watering my flowers and trees. West coast, the best coast! I was born on the east coast and grew up in the mid-west so it’s incredible living somewhere with no snow or humidity. Any specific places that you go to feel inspired? How do you pull yourself out of a creative rut? Museums are my favorite places to visit when I’m looking for inspiration. Art is so intimate and to be able to view work that is so close to someone’s heart and soul inspires me to keep creating. In regards to being stuck in a creative rut, I have found that refocusing my energy on learning more so about art instead of forcing something helps me the most. Whats the biggest misconception about freelancing? I think the biggest misconception about freelancing is that freelancers have a lot of time. You have to work nearly twice as hard to even get opportunities to work, and even then, its only on you to do your work. People are terrified of commitment but freelancing is all about commitment to yourself, your art and the hustle. List some of your must see spots to visit in the LA area. Who are your favorite female photographers/directors that you've been inspired by? Favorite camera and favorite film to use? I shoot with a bunch of different cameras so it all depends what the subject matter is. Canon Rebel t3 is my go to, and favorite film is probably Fujifilm Superia 35mm. I always keep an Olympus Stylus on my side for anything I capture during the day, it’s also a good chance to test new film. album that you couldn’t live without? ﻿Outkast – ATLiens. If it's Sunday and I put this album on best believe the whole house is going to be clean. Andre 3000 is also one of my favorite people ever, his energy, style, flow & attitude…a perfect human.